IOS Warm Boot | CCIE or Null! Reboot & update your router in half the time with warm reloads! Reloading a router can sometimes feel right like an eternity, usually when you issue a reload you can step away get a cup of coffee sit back down and the router should be just about be ready. For quite a while now (well since before 12.4 which lets admit is a long time ago) we’ve had to ability to ‘warm’ boot Cisco routers and cut the reload time in half! The first question we probably ask, is what exactly does the router do differently to decrease the time it takes to reload? Well, When you want a router boot, what is one of the first things you see it doing? Usually you see the router reading the flash card, grabbing the IOS and decompressing it into RAM, when you enable the warm reload feature the router skips this steps because it keeps this information in a reserved portion of memory. Showing the a warm reload skipping the load & decompress process and starting right at the initialization process. As mentioned after the initial configuration of the warm reload you need to initiate another reload of the router before the feature really becomes active. 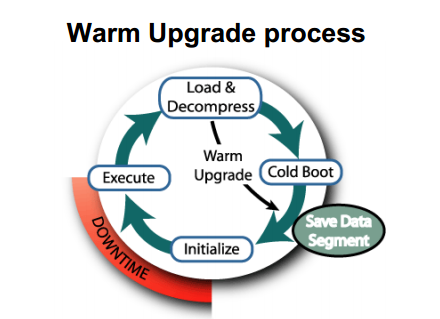 The count is the number of times you can perform a warm reload before you must perform another cold boot. uptime is the amount of time the router must online in between warm reloads this means you can sit back and continuously warm reload a router as soon as it becomes available. After the reload once the feature is enabled. 1 minute & 10 seconds! Much quicker! Now, what I think the best part of this feature is, is the fact we can use warm reloads to stage IOS updates, because let’s face it how many often do we decide to just randomly reboot Cisco routers! This process works in a similar fashion, the router will actually load & decompress the new image prior to going down, saving time. -Unfortunately I was unable to successfully do this, looks like more trusty old 1841 just couldn’t do it with IOS v15. Now, if only we could get this feature in NX-OS, when you reboot a Nexus you can forget about the coffee, hop in the car and get a pour-over from Starbucks come back, and you might still be waiting.